We are seeing a resurgence of retro in fashion for Spring 2015, and with it comes the wild floral prints of the ’60s and ’70s. They have, of course, been updated for this century, and designers have taken the femininity of floral and exaggerated it for Spring 2015. Thom Browne’s bright and bold separates look fresh and young. 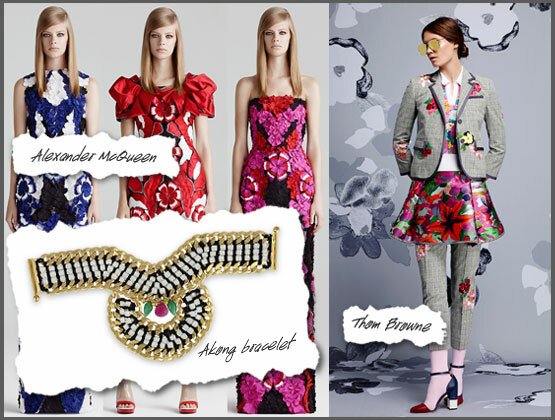 Dresses featuring these wild prints vary from Chanel’s perfect long sleeved, chiffon, floral print maxi to cocktail numbers from Dior. Christopher Kane and Alexander Mcqueen both play with texture, and the looks from both designers have 3-D qualities to them, creating a psychedelic experience in the garments. Bold jewelry gives a luxurious quality to this retro trend. Try a statement necklace featuring oversized gems or crystals, such as the metal, resin and crystal necklaces and cuffs from Akong. Dezso by Sara Beltran also presents beautiful rock crystal bezel pieces, which are not only a hot trend in jewelry, but have an organic quality to them that works flawlessly with this trend.